Ages 4 through 9. 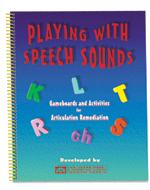 This book includes a variety of reproducible games and activities for teaching speech sounds and for remediating phonological processes. Game boards for /ch/, /d/, /f/, /g/, /k/, /l/, /r/, /s/, /sh, /t/, and other sounds are included. Gameboard Fun. This section includes gameboards for 18 commonly misarticulated consonants, gameboards for clusters with /r/, /l/, and /s/, and gameboards for final consonants. Game activities are included for the boards. Fill in the Word. Each worksheet includes incomplete sentences for a specific sound. Students are challenged to complete the sentences using words with their target sound. All of the gameboards and worksheets may be reproduced.